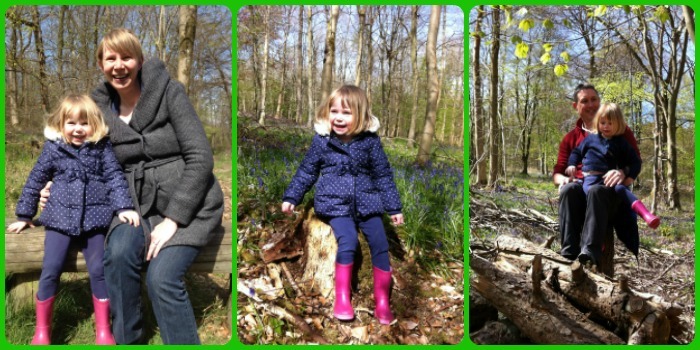 A lovely family walk amongst the bluebells at Dancersend. I love seeing the bluebells in bloom and as we wanted to make the most of the good weather on Sunday, it was the perfect opportunity to go and see some. 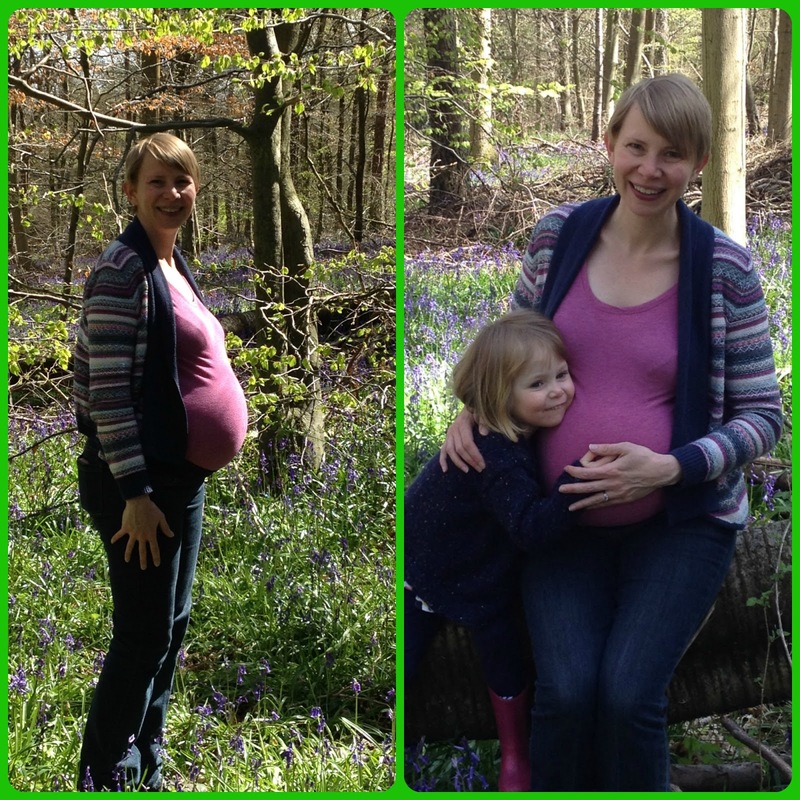 Last year we went to Cowleaze Woods to see the bluebells but we didn't want to venture as far this time as I'm conscious that baby number 2 is due in just a few days! We knew it would be really busy there and at Ashridge as well. Then I saw a discussion in a Facebook group with the suggestion of Dancersend Nature Reserve near Wendover and it was ideal. We parked up near the old Waterworks where there is a small car park (directions on the BBOWT website) and then followed the signs across the road into the Nature Reserve. There were some quite steep steps (35 in total as Little Miss A counted them) so it's definitely not a suitable for pushchairs etc. Just as we were about to tackle the steps, we spotted a stoat (or a weasel we're not sure which). It moved really quickly but was lovely to see. Not something I've ever seen in the wild and so glad that we all got to see it. 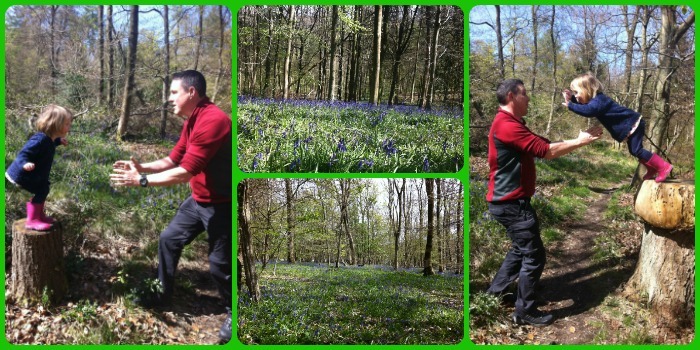 Once we got up the steps we started to see the first of the bluebells and then saw more and more. Absolutely stunning. They really are lovely en-masse. We started our walk in our coats but the weather was glorious and by the end we were taking layers off. The perfect morning for a family walk. I was expecting there to be a lot more people about seeing the bluebells, but we only encountered about a dozen others the whole time we were there. Little Miss A had great fun as usual climbing onto every tree stump she encountered! I love these action shots of her jumping off with her Daddy. We also managed to get a couple of bump shots as we're less than a week away from due date and we don't have that many pictures of bump. I tend to forget I'm pregnant when we're out and about, but I was very conscience not to overdo it and we made sure we didn't walk too far. We didn't need to though as there were bluebells everywhere. Dancersend was such a good find. Just perfect for what we wanted. 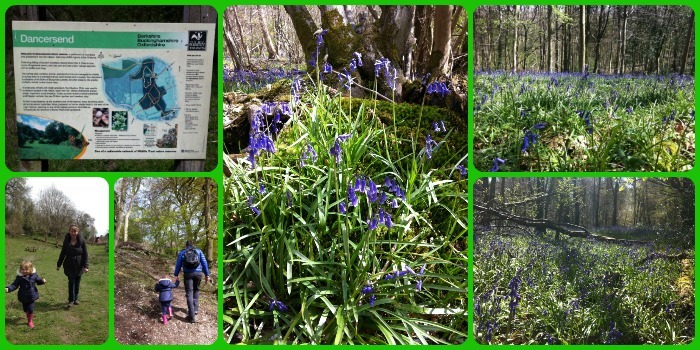 If you're looking for somewhere local to see the bluebells then this is definitely a great place and one to visit if you want to avoid the crowds! Thanks Katy. It was a lovely walk. I think I'm quite fortunate that I carry babies quite well so can be active right up to the end. Hope the rest of your pregnancy goes well.